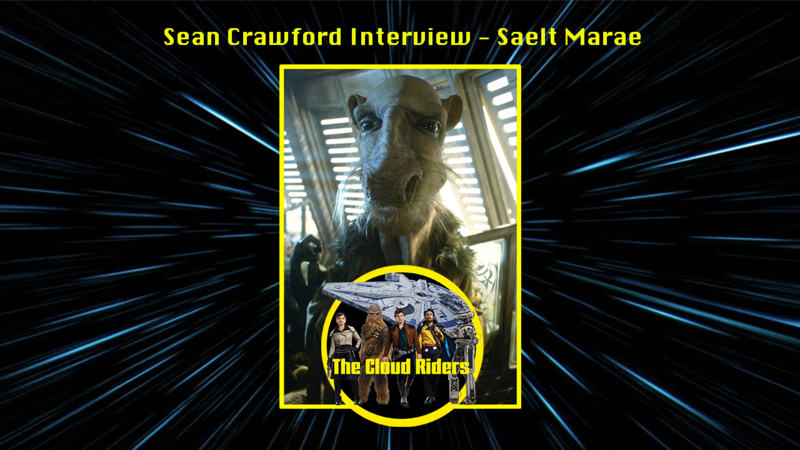 Saelt-Marae was a Yarkora who worked for Jabba Desilijic Tiure, a powerful Hutt crime lord. Posing as a humble merchant, the Yarkora mingled with the various denizens of Jabba’s fortress on Tatooine, learning of the intrigues developing behind the Hutt’s back and revealing those to his employer. Shortly before the Battle of Endor, Saelt-Marae traveled on board Jabba’s sail barge Khetanna to the Great Pit of Carkoon to witness the execution of two of the Hutt’s prisoners, Luke Skywalker and Han Solo. The prisoners were to be fed to the Sarlacc which resided in the pit, but managed to escape and kill Jabba before destroying the sail barge. How does working on Star Wars compare to other jobs you’ve had in the past? My work at the time was always varied. I worked with Tim Dry under the performing name Tik and Tok. We were a Mime and Music act most well known for our unique robotic act of the time. So we were doing a lot of UK TV appearances from the Royal Variety to The Generation Game and also some commercials. Our stage act was picked up by the New Romantic scene of the time and we were fortunate to have been invited to do tours and guest spots with many popular bands like Gary Numan and Duran Duran. My parts in Return Of The Jedi took about a month to film (three weeks as Yak Face on Jabba’s Palace and Sail Barge. Then one week as a Mon Calamari on the Rebel Cruiser). We were always skint and keen to earn an extra bob after filming so we would rush off to other jobs; sometimes we would do our robot act at private parties, a popular cocktail bar or a night club. We were also on call for the BBC Top of the Pops to do a live performance to Kraftwerk’s ‘Showroom Dummies’. Having never worked on a big budget film everything was a “WOW”. The huge production team worked like soldier ants to complete their tasks efficiently from the call sheets to the photo calls, everything was meticulously planed. This was so different from Rock and Roll live performances. A walk around the sets was amazing, the sheer scale and yet the detail was beautiful. These were 3D sets, I was used to 2D stage sets and if lucky a backdrop. I would say it was a real eye opener. How did you get you role of Yak Face? I was called to a casting with mime artists from all over GB for a Blue Harvest production. Phil Tippett orchestrated the casting in a West London church hall (which was used at the time by my Mime teacher Desmond Jones). I think he was looking for a group of fit mimes that would have the agility and strength to work with his creations. I was lucky enough to get the call and it wasn’t until I turned up to Elstree Studio where Phil gave me a head, did I know Yak Face was my character. What are some of your fondest memories from your time in Star Wars? The fun started at 6.30am when Graeme Hattrick (Tanus Spijek) picked me up in his old banger of a car with Tim Dry (Whiphid) already in the back. It was about an hours drive to the Studio. We would sign in, grab our costumes from Wardrobe and wait in our dressing rooms for an assistant to come and get us ready. After the mornings shooting and lunch there was a lot of socialising. Mine and Tim’s dressing room was the centre of much amusement. We were forever bringing in things to entertain ourselves, like our almost pocket size Casio PT-1 Keyboard and Roland TR-606 Drum Machine (remember Synthesizers were edgy things at that time) to knock out some riffs. It seemed as though we had an endless stream of visitors popping in, so much so we would prank unannounced members of the cast entering our room with a cup of talc carefully balance on top of the door giving them a good old powdering. Everyday was a new day and never a dull day. You could look around and see smiling faces everywhere. Everybody loved their part. I was a fan the day I watched A New Hope in the Curzon cinema on Kings Road in 1977. My best mate of 40 plus years was also in the cast and to this day I am fortunate enough to have travelled the world seeing the ever evolving SW Community with it’s Pop Art and Culture. Golly, I have so many friends from Autograph and Toy collectors to the hard working charity troopers of the 501st Legion. Star Wars has always been a positive experience and has been for nearly the best part of my life. It was in August 2003 I signed my first Yak Face photo in a pub in Notting Hill for autograph hunter Graham Miles and he introduced me to the world of conventions and Steve Sansweet. Since then I have had the enviable opportunity to travel the world with others from the cast meeting the SW community. I love having one on one chats with those that stop at my table. I still get nervous about the silver pens splattering a poster with a lifetimes collection of autographs, and honoured when someone brings in their treasured Vintage POTF or Tri Logo carded Yak Face Figure to have a photo with me. It is through the Conventions I made many friends of the 501st Garrisons and when I was made an Honorary member in 2014 it was the highlight of the year. I have made so many good friends from the collectors world to illustrators, sculptors, tattooists the list goes on as does the ever growing SW pop art and culture. As appearances go, I was at the Belgium Comic Con in March. Unfortunately I will not be at Celebration this year in April. I have Union Of The Force 5 (Germany) in May, I have a pencilling in Manchester in June and ICCC (USA) in September. I usually manage about eight in a year. I have a few pencils but waiting for confirmations. Generally I would put up a quick post on my Facebook page. How long did it take to get into your costume, and what was it like performing in it? The Yak Face costume was about seven articles. Firstly I would put half a cup of talcum power on then slip into what looked like a blue loosely fitting ski jumpsuit which had fur trimmings on the chest and arms, then pop on a couple boots. Before I could fasten the suit I would get strapped into a harness holding the head. Then when the head was in position, one would go on a hessian coat and finally the two arm hoofs . As a prop I was given an ornate goblet. The process of getting ready took about 20 minutes. You were involved in one of the greatest movie scenes of all time, the Jabba’s palace scene. What was that experience like? The filming of Jabba’s Palace was the first scene I was in. The set was amazing. It was like the best ever night club you would want to walk into. I was guided in full costume onto the set by a helper as I had little to no vision. There was a tiny gauze on Yak Face’s neck that I could just about see through. I also wore two hoofs, which were like putting your hand in a couple of mud filled bags with a bar to hold on at the end. But when trying to look around the room full of dimly lit creatures in a smoked filled room, the little I could see was all very surreal. For the most part there was a lot of waiting and lighting and camera angles checked. Then when we were in position in would come the stars Carrie, Mark, Harrison or Anthony to play their parts and interact with Jabba and us. There were a few creatures that struggled with the heat as the filming went on but in the breaks hair dryers were used to blow cold air into our costumes to bring the temperatures down. I was very much in the background in the Palace shots chilling on some cushions in an alcove or peering over the other creatures looking in the Rancor pit. What was it like working with so many other people in alien/creature costumes? As I have said previously a lot of the shots I was in the background. However on the Sail Barge there was to be a Yak Face featured scene. Jabba the Hutt rides like a sultan in the massive anti-gravity ship. His entire retinue is with him, drinking and eating and having a great time. Threepio stands between two horrible creatures, translating their conversation. Both monsters speak in strange tongues. One of the beasts gets angry at something the other has said, and punches him in the face. Threepio takes this as a sign to leave; which he does in haste, bumping into a smaller droid serving drinks, spilling them all over the place. The stubby droid lets out an angry series of beeps and whistles. Threepio finally recognises the robot. This clip took a whole day to film a 90 second scene and involved all the creature cast and extras on the Sail Barge set. Yak Face and Ree Yees argue over a trade. (I think it was captured creatures for slaves) with C3PO translating our rather animated argument to Jabba. Thanks to a bit of winding up from Salacious Crumb things became a bit raucous and soon escalated into hoofty cuffs. Yak Face let go an upper right hoof to Ree Yees centre eye but caught C3PO in doing so and laid him out on the deck, all much to the delight of Jabba’s entourage who joined in the drunken bundle. The scene was edited and I saw it in full at the screening for the cast at the Marble Arch Odeon in 1983. Then it was not until 1985 I saw public release and noticed the scene was missing. This was confirmed in 1986 on the video release. It was only when the DVD came out that pictures from the cut scene made an appearance. What are some of your favourite characters and scenes from the films, and why? I would have to start with Episode IV, the Star Destroyer opening scene. A visual effect that was breath taking at the time and set the standard from then on. After the film, all I wanted was a C3PO outfit to parade down Kings road when fashion cruising was a regular Saturday event. The story line twist in Episode V, “I am your father “ so unexpected and blew my mind. Unfortunately with years of conventions with David Prowse, Darth Vader’s voice has been replaced by a west country accent which I cannot get out of my mind now. There have been scene after scene worth of amazing sets locations and effects. I loved the duel between Obi-Wan and Anakin, where there was a lot of action. Then there is the battle of Hoth, these are just things you did not expect like the speeders taking down the AT-AT walkers. My list goes on and on. In 1985 a toy of Yak Face was made; it quickly became one of the rarest Star Wars figures around. How does it feel knowing your characters figure is valued so highly? I only wish I had known a figure of the character came out at the time. At £1.85 each I would have bought a box of them to give to family and friends. I did manage to pick up a loose one much later on. I have a personal love for its sculpted look and feel. It is usually displayed on my convention table much to the delight of many collectors. Now as the rarity value of the figure soars to new heights and carded ones valued at three times its weight in gold, it has moved into an iconic status.